A man who survived more than two months lost at sea in the Atlantic Ocean has been rescued and safely returned home. The crew of a German container ship found Louis Jordan, 37, on the overturned hull of his sailboat off the North Carolina coast on Thursday. Jordan had been missing since January 23, after he told his family he had planned to go fishing in the open sea. He said he survived for 66 days on rainwater and raw fish. 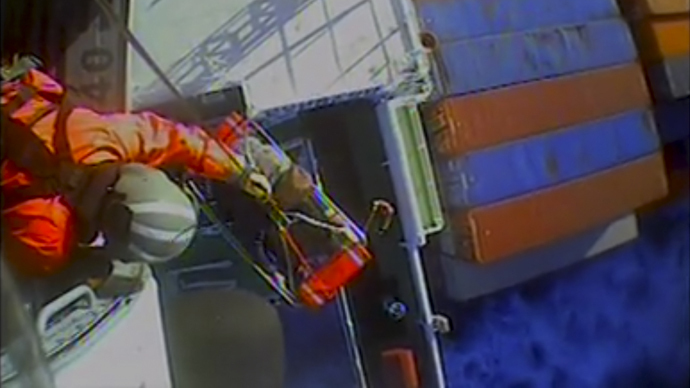 The US Coast Guard, who collected Jordan by helicopter from the container ship, said he was in remarkable condition with no obvious sunburn or other signs of distress. By the time they picked him up on Thursday, he had showered and already spoken to his family. Jordan said he got by by rationing his water and praying for help. According to the Coast Guard, he managed to catch and eat fish raw. “Every day I was like, 'Please God, send me some rain, send me some water,” Jordan told WAVY-TV. Jordan had been living on his boat in a marina near Myrtle Beach, South Carolina before telling his family he was heading to open sea to go fishing. His father notified the Coast Guard in Miami that he hadn't heard from his son in a week. Alerts were then issued from New Jersey to Miami. A search began February 8 that lasted 10 days, and the Coast Guard also checked Jordan’s financial data to see if he had been onshore. Jordan told WAVY-TV he was traveling north when his boat hit bad weather, eventually capsizing on him. The manager of the marina where Jordan docked his boat told the AP that Jordan was self-contained and knowledgeable of some survival skills. He reportedly caught most of the fish he ate, and the berries and mushrooms he picked. “He was in fairly good condition for a guy that you would normally expect to see after 60-plus days offshore,” added Lt. Jack Shadwick, the Coast Guard helicopter's co-pilot.